How dangerous is it to shovel snow? I recently wrote about the beginning of flu season. Well, what goes hand in hand with flu season? Cold weather and snow shoveling. Hopefully, you have gotten a flu shot by now and are set up to face flu season. 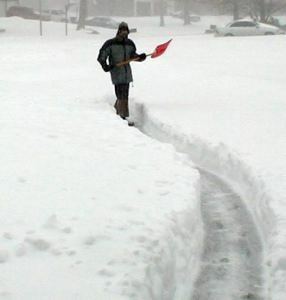 I just wanted to remind you that you need to use your brain as well as your back when it comes to shoveling snow. How Dangerous is snow shoveling? We have only about six weeks of winter left, but it it never too late to remind you that snow shoveling is dangerous business. It is the New Year and also for many of us the onset of snow shoveling season. If you are a reader on the East Coast, where the El Nino blizzard hit, please be aware that in terms of your body shoveling snow is not a totally innocent activity.